South Korean optical specialist Samyang has announced its first autofocus-enabled lens for Canon DSLR users. The Samyang AF 14mm F2.8 EF is compatible with both APS-C and full-frame bodies in Canon's EOS DSLR stable, which stretch from the beginner-focused EOS 1300D at one end through to the flagship EOS-1D X Mark II at the other. It marks a change in direction for the company, which has traditionally focused on providing DSLR and mirrorless users with a range of affordable, manual-focus lenses, in addition to its video-centric optics. The new optic provides a 14mm focal length for full-frame users, and one that's closer to an effective 22.4mm when used in conjunction with a APS-C body such as the EOS 80D or EOS 200D. The barrel has also been sealed against inclement weather, which should be of particular interest to those whose bodies offer a similar level of protection. Its AF motor promises to be quiet, fast and accurate, which, the company claims, is partly down to a "minimised" lens group. Its internal configuration, meanwhile, sees 15 elements spread over 10 groups, and 7 of these are said to boast special optical properties such as aspherical surfaces. 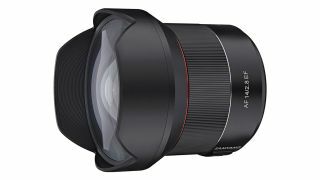 The lens weighs 485g without its lens caps or hood, and is set to be available from February. A suggested retail price of £649 has been set for the UK, although pricing for other territories has not been disclosed as of yet.